The Lawless Legends RPG Corral! Combat and options are fully functional! NPCs joining your party and controlling them in combat works too! Ranged combat and ranged weapons work! It all fits on 2 disks (3 sides)! While you wait for Lawless, play this! 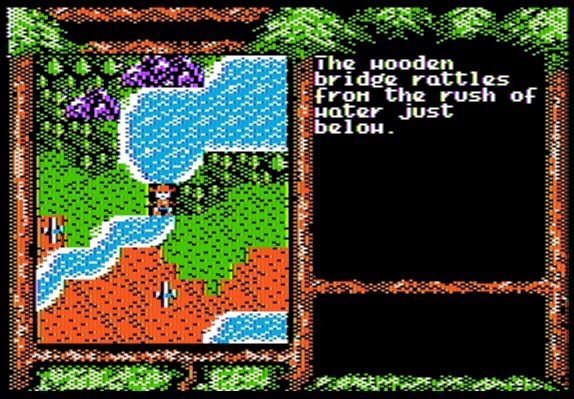 While we work on Lawless Legends we thought you’d like a NEW mini adventure to play: Ancient Legends is a fantasy Role Playing game made for the Apple II series of home computer created by 8 Bit Weapon and friends! The game was created as a DEMO for the Outlaw Editor! The Story: You are Quinn of Thane, the westernmost island in Merkania. Since the last of great wars your family has lived in peaceful seclusion for generations. Raised on ancient legends, you have often dreamed of exploring what lies beyond the island. You surmise that dark times must have befallen the mainland, as dark creatures now sully the sanctuary of your island home as well. Update 03/06/2016 – Animation, Combat, & More! Howdy! In this edition we see lots of updates: new text font, working combat, and working animations! More to come later this fall/winter! We now have smooth transitions from 2d tile maps to 3d raycasting maps! Special thanks to Martin Haye for this amazing tech breakthrough! 2D map now has working scripts! We now have our world map working with scripts! We are working on animating our portraits! We are sorting out just how many frames to add, but we’re off to a great start~! Co-Developer Martin Haye’s demonstration of Lawless Legends @ Kfest 2014! 2d Engine for the wilderness overworld operational! Thanks to the coding efforts of Martin Haye and Brendan Robert we now have a working 2d engine! The 2d side for the game will be what players explore between towns/mines/etc that are 3d once you enter them. New Portraits for special locations, shops, and combat~! Seth here from the art department! I wanted to show how the graphics are made and also preview some images I’ve created for the game. First off, let me start with saying Brendan Robert did an A+ job developing the Outlaw Editor from scratch! It even emulates the way the pixels behave on an apple II with their quirky color artifacts. There has been some touching up by Martin Haye here & there (with some scripting Plasma by Dave Schmenk too) but overall this is Brendan’s baby. Below is what it looks like when you want to create a tile graphic. 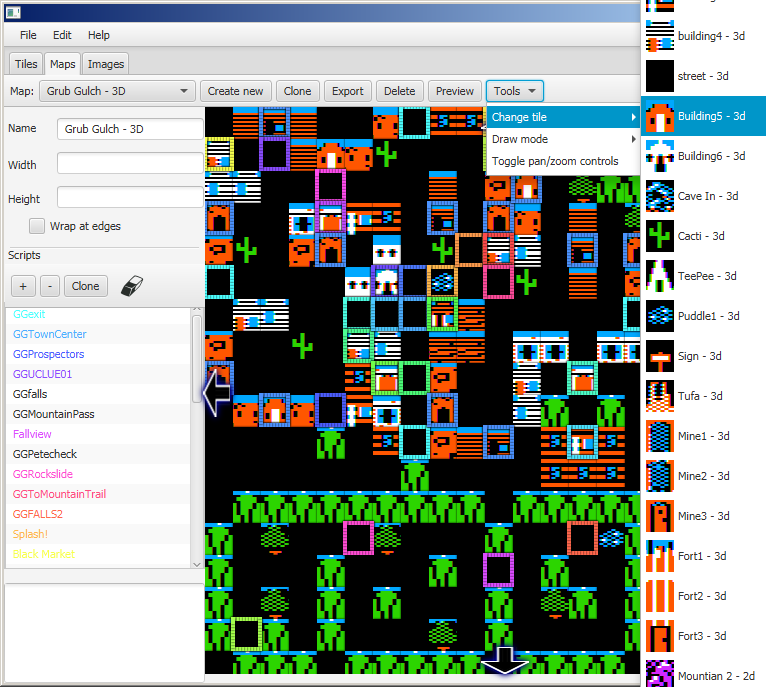 The tiles are used in 3 ways in the game: 1) For 2d Map tiles (surprise!) 2) To map out the 3d towns 3) We will also be using them as animated icons as seen at the bottom left of the Lawless Legends Player UI. Also notice the 3 options on the center left of the Outlaw editor. Those “flags” tell the program what type of tile it is for both 2d & 3d maps. The first is self explanatory but the last two not so much. To flag a tile as a sprite tells the program that the 3d render 2d image must face the camera at all times, where as the rest of the artwork for walls are rendered in true 3d. The third flag tells the program to not draw any of the graphics behind the wall/object to save processing time. With Outlaw Editor we can create 2d & 3d maps of any shape or size. Just pick a tile from the list on the right of tiles and let your imagination do the rest! On the far left side you’ll notice a list of colored names. Those are tied to the corresponding squares that are floating above special tiles that have “Scripts”. That’s it, hope you enjoyed that!